I love reading and I started reading very early. There was a time when I read everything. I used to say that I will even read toilet paper if it has something written on it! I no longer try to read toilet papers, but I still read a lot. During my travels in different parts of the world, I have sometimes come across art, sculptures and monuments celebrating and remembering writers, poets, journalists and their books. This photo-essay is about those works of art that celebrate books and authors. This photo-essay on art and sculptures about writers and their books brings together three of my passions - reading, art and photography. If you love reading, you may have your favourite authors that you may cherish and remember even after decades. Most of my favourite authors from my childhood were from my father's collection of Hindi books - Krishen Chander, Nanak Singh, Shivani, Chatur Sen, Rangey Raghav, Muktibodh, and many more. They were not books for children, but that did not stop me from reading them! Growing up, I discovered English books. Then, over the last decades while living in Italy, apart from Italian writers, I also discovered some Latin American and European writers. Through the images of this photoessay, I hope to make you think about your own favourite authors and books. 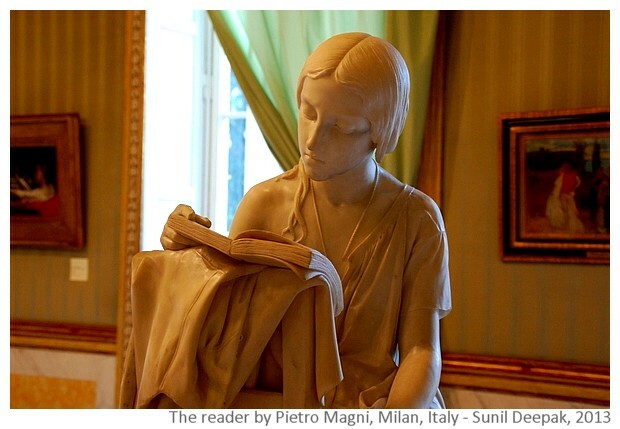 Let me start this photo-essay with two images of a sculpture by Italian artist Pietro Magni (above and below) that show a young woman lost in a book. 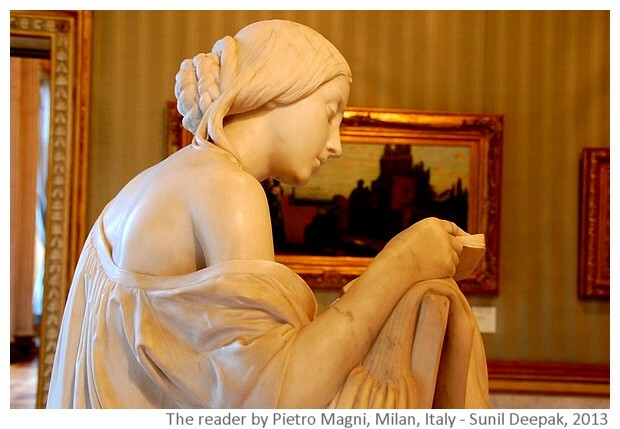 This sculpture is displayed in the Brera museum in Milan and when I first saw it, I fell in love with it. 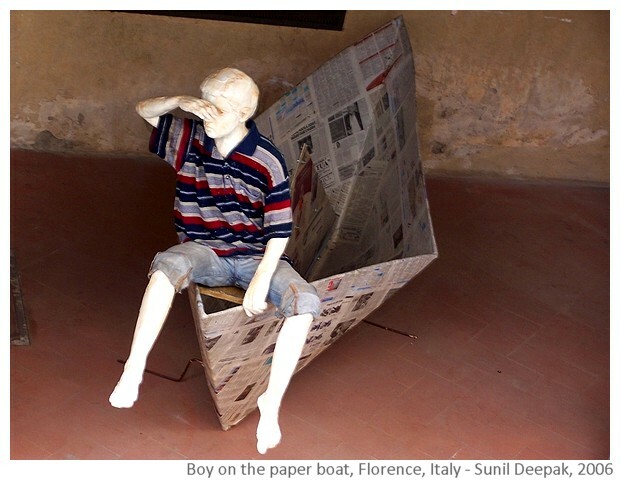 The next image in this collection is from the Innocenti building in Florence that hosts the UNICEF office and shows a boy sitting on a paper boat. I think that it wonderfully illustrates the capacity of a good book to transport you to far away lands of imagination. 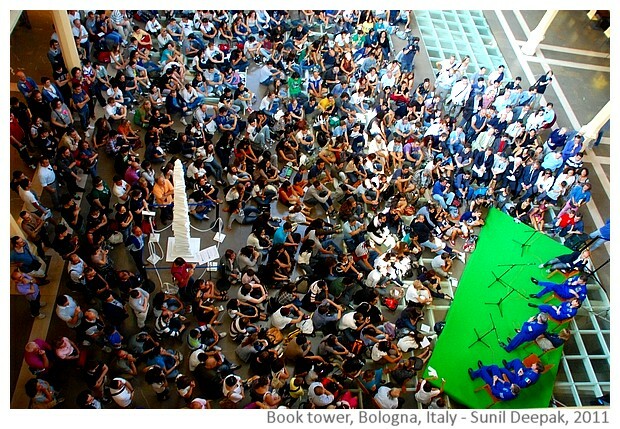 The next image is of an unusual tower made of hundred white coloured books by the Italian sculptor Lorenzo Perroni, who specializes in sculptures of white coloured books. I clicked this picture during the visit of a group of American astronauts to the Sala Borsa hall in Bologna. So you can see the astronauts in the lower right corner, with people sitting on the ground in front of them and the white columns of books towards the left. The next part of this photo-essay is divided according to countries where the pictures were taken. There are two images from the Central Park in New York. 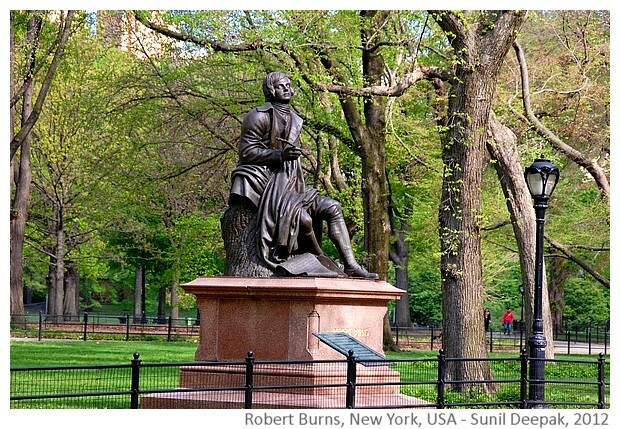 The first one has a statue of Robert Burns, also known as Robbie Burns. He is considered to be the national poet of Scotland. According to the Wikipaedia, "He is regarded as a pioneer of the Romantic movement, and after his death he became a great source of inspiration to the founders of both liberalism and socialism, and a cultural icon in Scotland and among the Scottish Diaspora around the world. Celebration of his life and work became almost a national charismatic cult during the 19th and 20th centuries, and his influence has long been strong on Scottish literature". 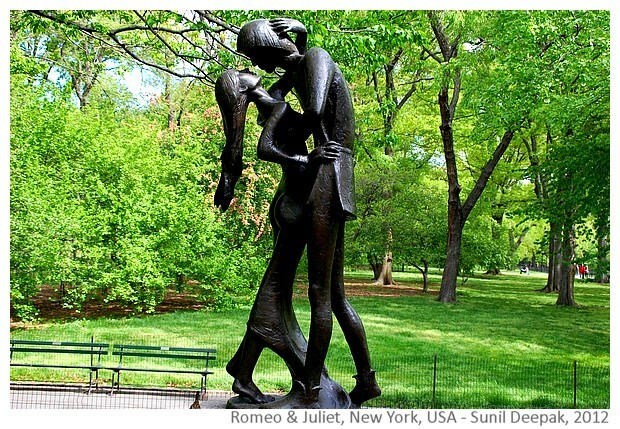 The second image is of a sculpture showing two characters of one of the most famous and enduring love stories of the world - Romeo and Juliet - by the British playwright William Shakespeare. 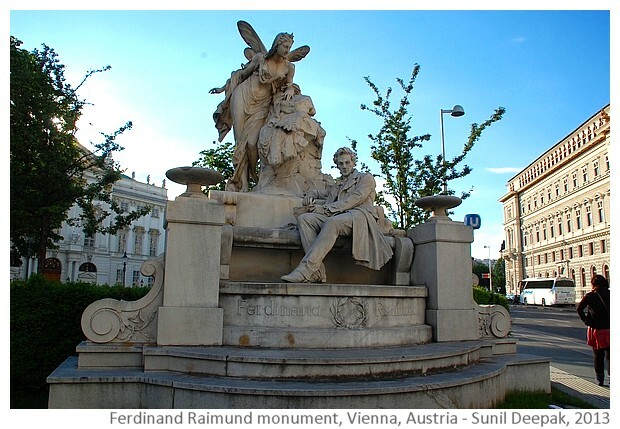 The next image is from Vienna and shows the writer and playwright Ferdinand Raimund (1790-1836) near the opera building. He is credited with a number of important books and plays in German. Bitten by a dog and afraid of a painful death due to rabies, because no treatment existed for this disease at that time, he committed suicide at the age of 46 years. 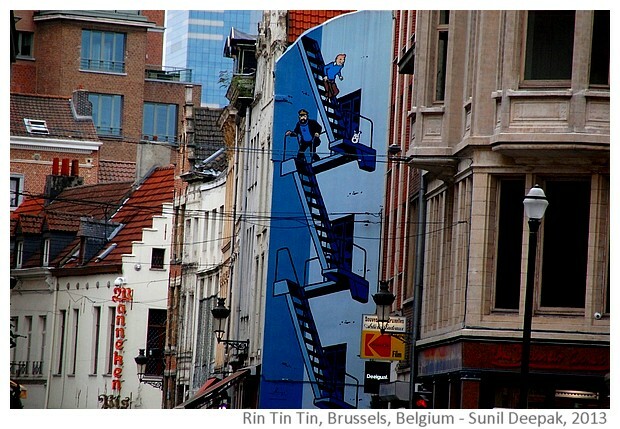 The next three images are from Brussels, the capital of Belgium. The first one shows two lovers at the lake - they are Thyl and Nele, the characters of a book by the Belgian writer Charles De Coster. De Coster is considered to be the father of Belgian writing. 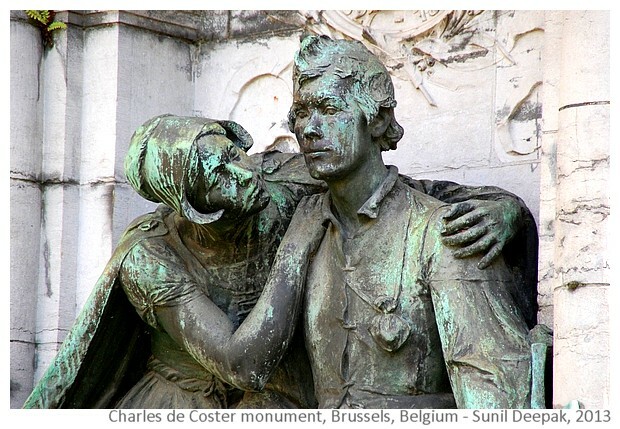 This monument is the opera of the sculptor Charles Samuel, a fan of De Coster. The monument also has many other characters from De Coster's books on its sides - a cat, a cooking pot, a spinning rod. The next image shows two of the principle characters (Captain Haddock and Tintin) from the iconic comic books about the adventures of a boy called Tintin. These comics were written and illustrated by the Belgian author and artist called Hergé (his real name was "Georges Remi"). Tintin is considered to be one of the most popular European comic books and these have been translated into different languages. 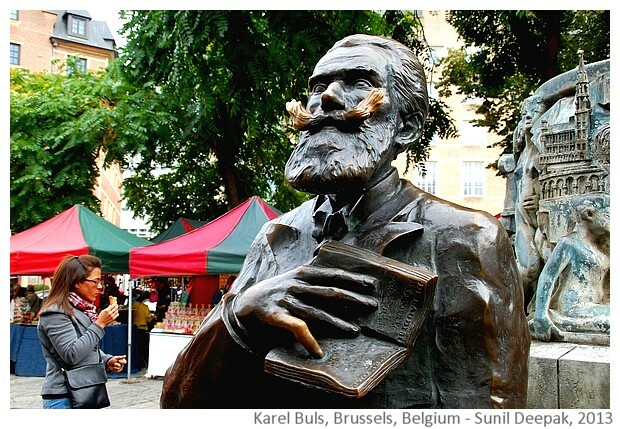 The third image from Brussels shows a statue of Charles Buls (also known as Karel Buls) placed in the Agoraplein square, close to the Grand Place square. According to Wikipaedia, "He was a Belgian politician and mayor of the City of Brussels. Buls was an accomplished and prolific author, not merely on educational and artistic issues but also publishing accounts of his travels abroad. Buls became Mayor of Brussels in 1881. However, along with these reforms, his most lasting achievement was the result of his opposition to the grandiose architectural schemes of King Leopold II, and the resulting preservation of old parts of Brussels. " 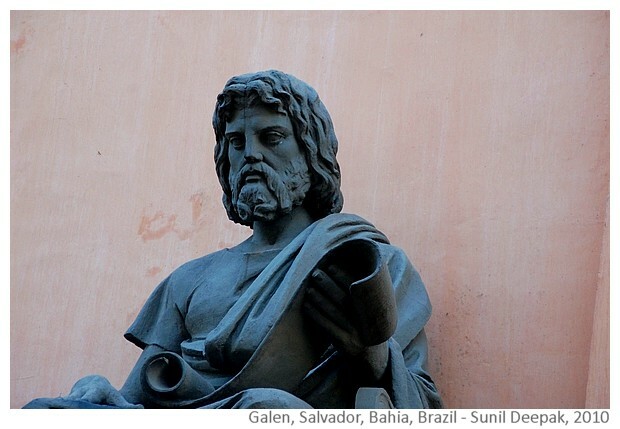 The next five images are from Brazil. 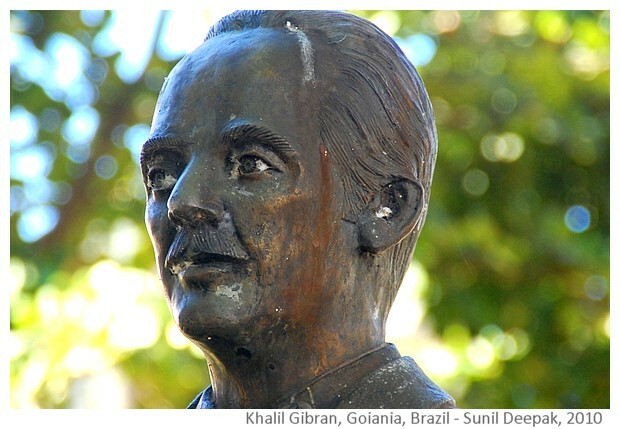 The first one has the bust of famous Lebanese writer Khalil Gibran in the city of Goiania. He was 12 years old when his family emigrated from Lebanon to USA. He died at 48 years and wrote in both Arabic and English. His most well known book is "The Prophet". Many of the words of Khalil Gibran have been quoted infinite number of times and will be familiar to readers across the world. For example, you must have heard these - "If you love somebody, let them go, for if they return, they were always yours. And if they don't, they never were." Another of his quotes that I like, says - "I have learned silence from the talkative, toleration from the intolerant, and kindness from the unkind; yet, strange, I am ungrateful to those teachers." You can check many other quotes from Gibran at Goodreads. 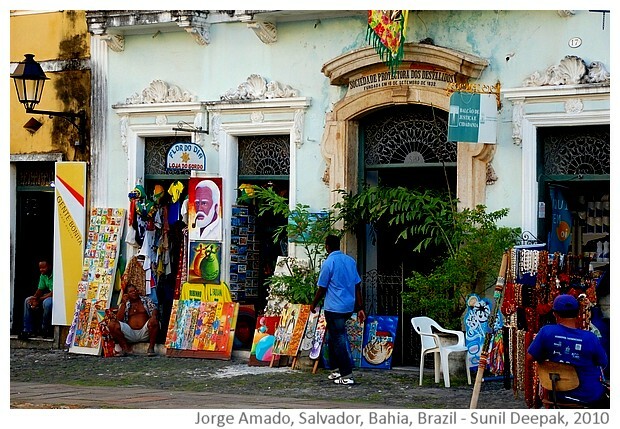 The next image is from Pelorihno, the old city on the hill in front of the port of Salvador do Bahia, where the well known Brazilian writer Jorge Amado lived. His house in Pelorinhno hosts a museum and shops around sell his souvenirs including his paintings showing him with a pipe in his mouth. 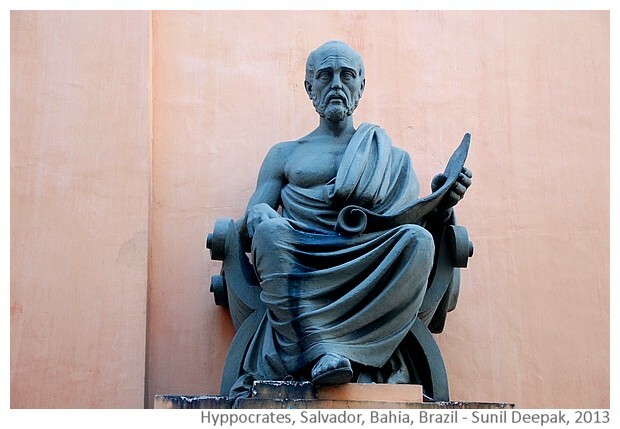 The next two images are from the medical college in Pelorihno, showing two ancient Greek philosophers, writers and scientists - Hippocrates and Galen. 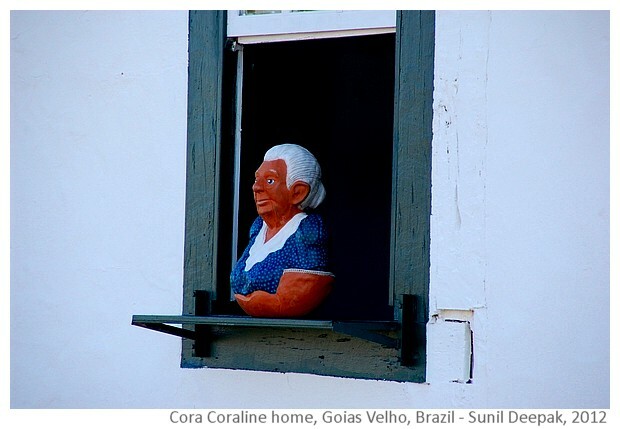 The last image from Brazil shows the house of Cora Coralina, an Afro-Brazilian slave during Portuguese occupation, in the historic city of Goias Velho. The house is located next to the river Rio Vermelho and there is a statue of Cora standing at the window, looking over the river. Cora was a poet, who wrote about the degradation of slavery and her poems inspired hundreds of other Afro-Brazilians to seek a life of dignity. 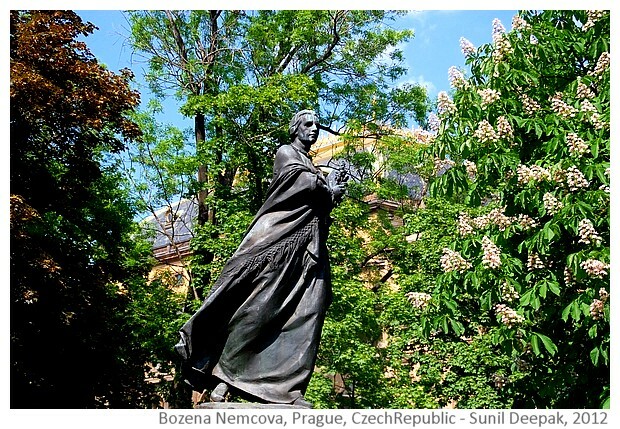 The next image of this photo-essay is from Prague and shows the statue of a women writer - Bozena Nemcova (real name "Barbora Panklova). Writer of fairy tales and legends, she is best known for her novel Babicka (Grandmother), an autobiographical book about her childhood with her grandmother. The next four images are from India. 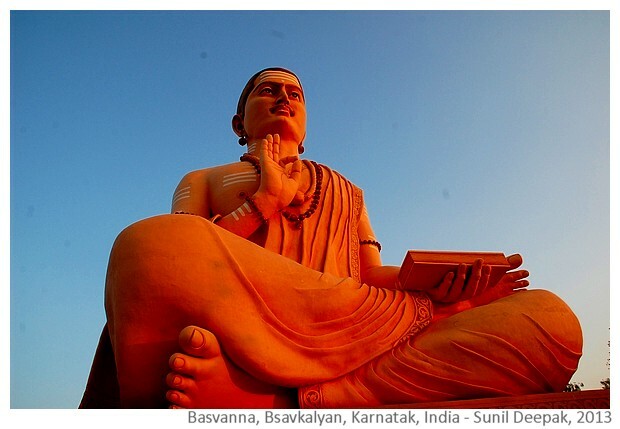 The first image has the iconic figure of Basvanna from Basavkalyan in Karnataka, who is known for his Vachana-sahitya. 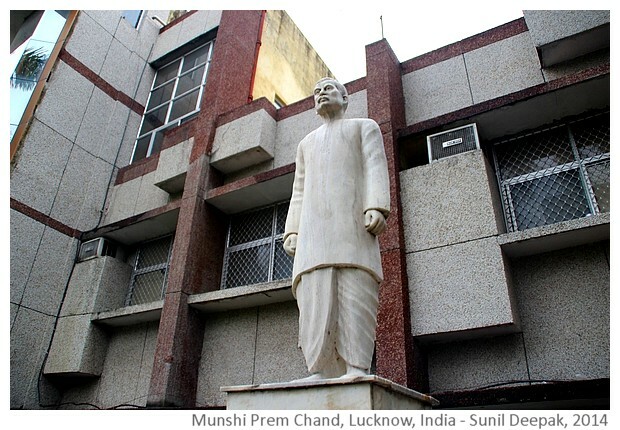 According to Wikipaedia, "He spread social awareness through his poetry, popularly known as Vachanaas. Basavanna used Ishtalinga, an image of the Śiva Liṅga, to eradicate untouchability, to establish equality among all human beings and as a means to attain spiritual enlightenment. These were rational and progressive social thoughts in the twelfth century." 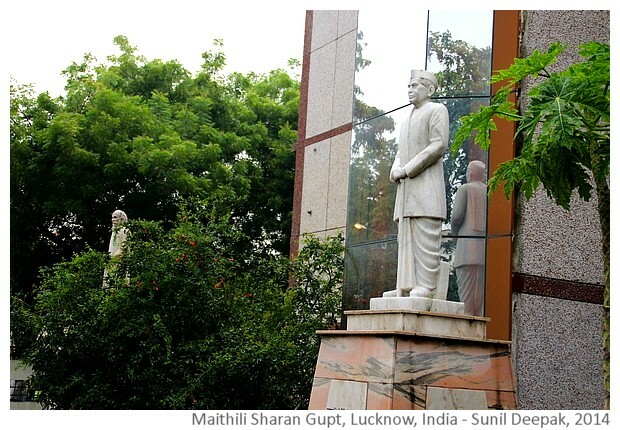 The next two images are from the Hindi Bhawan in Lucknow (Uttar Pradesh) and present two important personalities from the world of Hindi literature - national poet of India, Maithili Sharan Gupt and the iconic writer Munshi Prem Chand. 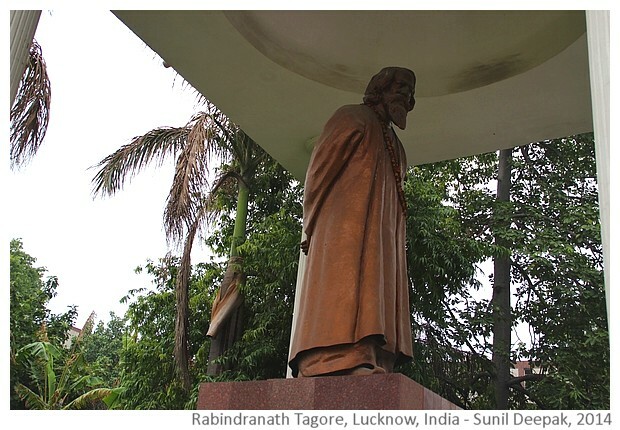 The fourth image from India shows Nobel laureate poet, writer, playwright and freedom fighter, Rabindra Nath Tagore. The images of writers from Italy are more numerous than all the other countries in this photo-essay. This may be because I have travelled widely in Italy. 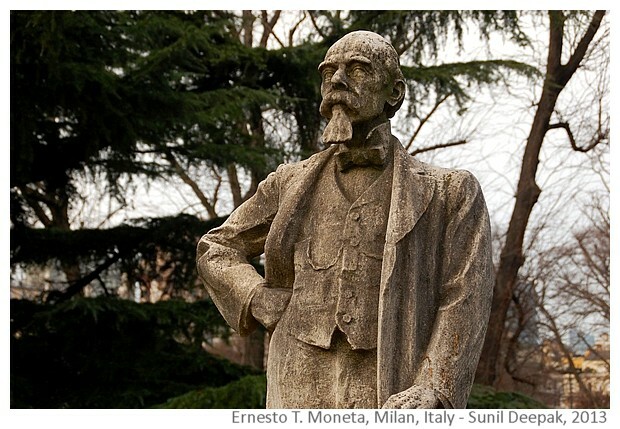 Perhaps, this has also to do with greater willingness in Italy to honour artists and writers in the public spaces. The first three images are from the gardens of Villa Borghese park in Rome. The first image shows the Ukrainian born Russian writer and playwright Nikolai Gogol. 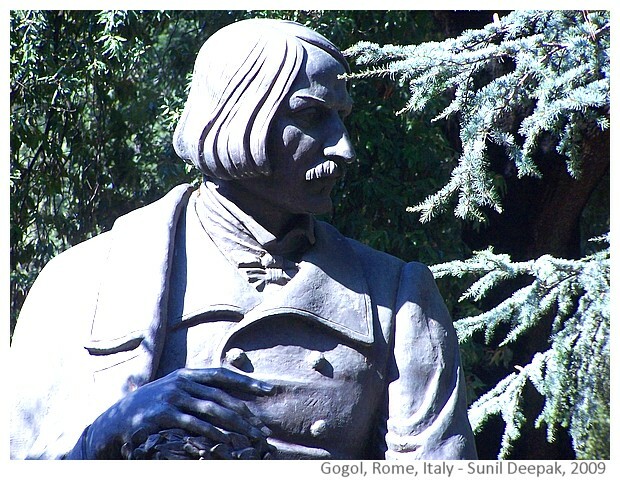 In her book "The Namesake", Jhumpa Lahiri had paid homage to Gogol by giving his name to her hero. 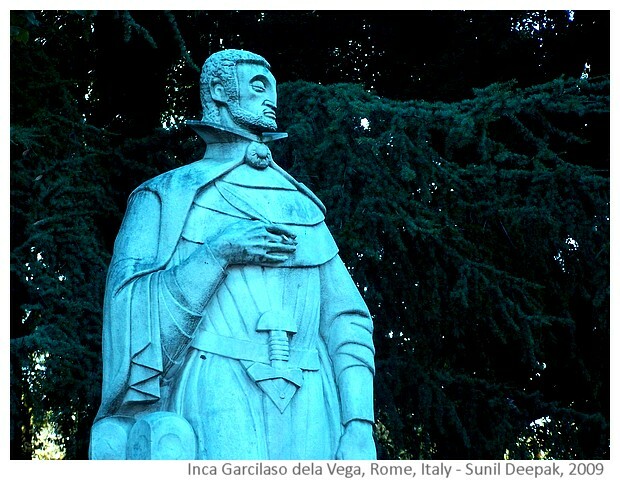 The next image has the Peruvian writer Garcilaso de la Vega known as The Inca, from Villa Borghese gardens of Rome. He wrote about the Spanish colonizers of Peru. The son of a Spanish conquistador and an Inca noblewoman, he is recognized primarily for his contributions to Inca history, culture, and society. 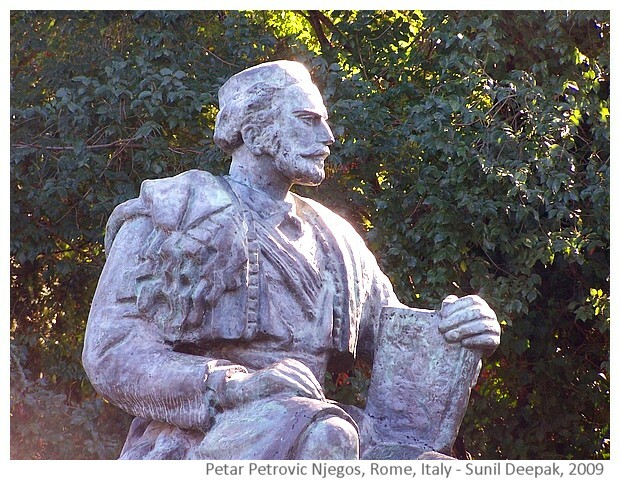 The third image from Villa Borghese gardens of Rome has a writer from a tiny eastern European country called Montenegro - Petar Petrovic Njegos, who was a nobleman and a poet. As the Prince-Bishop of Montenegro, he is credited with modernization of his country. 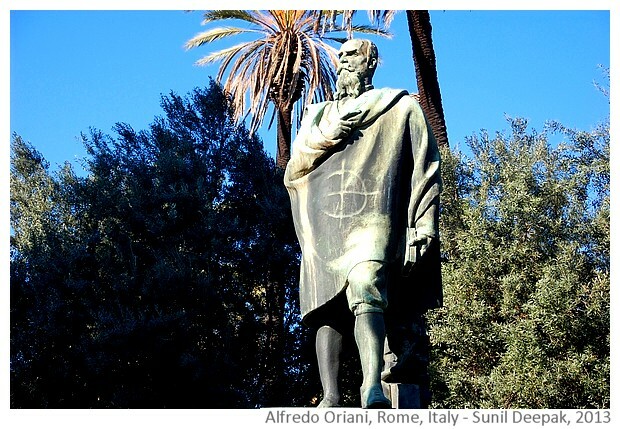 The fourth image is also from Rome, from the ruins of Traiano's baths near the Colosseum, and shows the statue of Italian journalist and writer Alfredo Oriani. 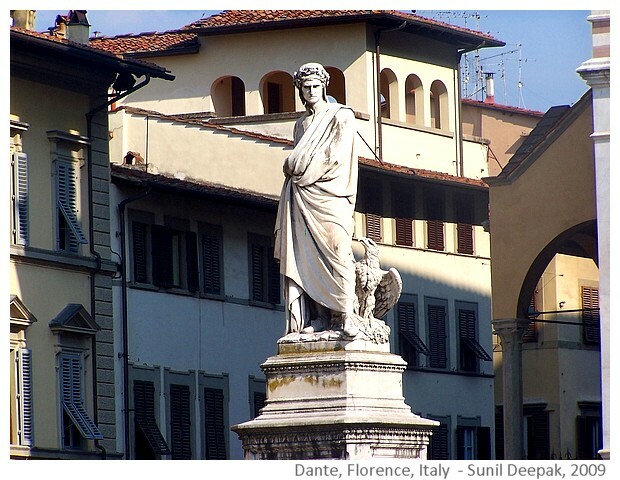 The next image is from Santa Croce square in Florence and shows the most well known Italian poet Dante Alighieri, famous for his epic poem "Divine Comedy". The next four images are from a garden near Cavour square, close to the Brera museum of art in Milan. 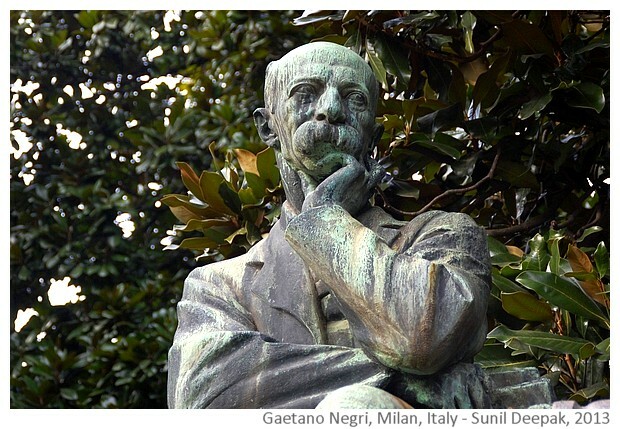 This garden has many statues of writers, journalists, philosophers and scientists. The first of these images shows the well known Italian journalist and newspaper editor Indro Montanelli, writing on his old typewriter. He is shown as a young man, his severe face is focused on his writing. It is a remarkable piece of art. 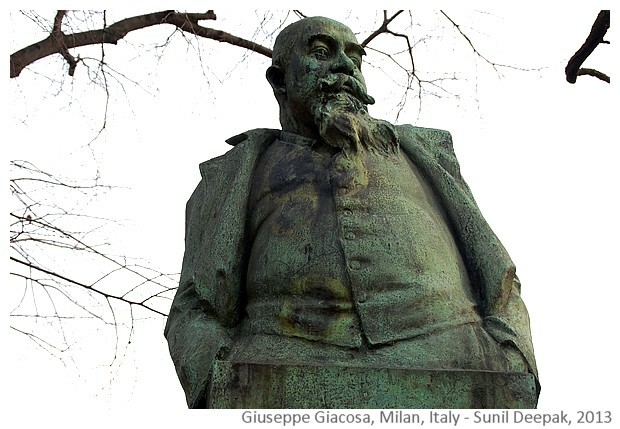 The next images have 3 Italian writers - Ernesto Teodoro Moneta, Gaetano Negri and the playwrite Giuseppe Giacosa from the Cavour square park in Milan. 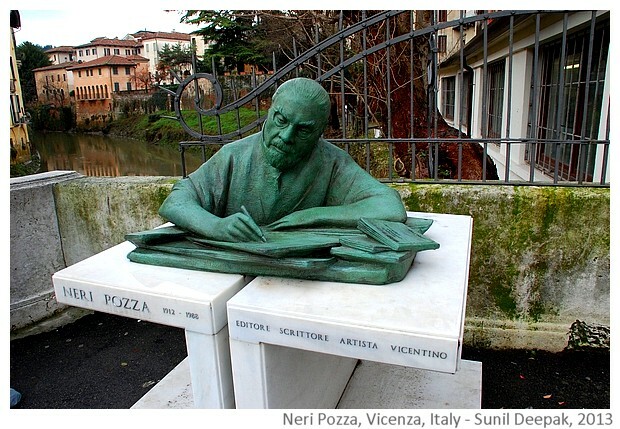 The next image is from the city of Vicenza and it shows the writer, editor and publisher Neri Pozza. The sculpture is close to the bridge on the river Bacchiglione, just behind the famous Basilica built by Andrea Palladio. Neri Pozza is one of the reputed contemporary publishing houses in Italy, who have published the Italian translations of different Indian authors including Alka Saraogi and Anita Nair. 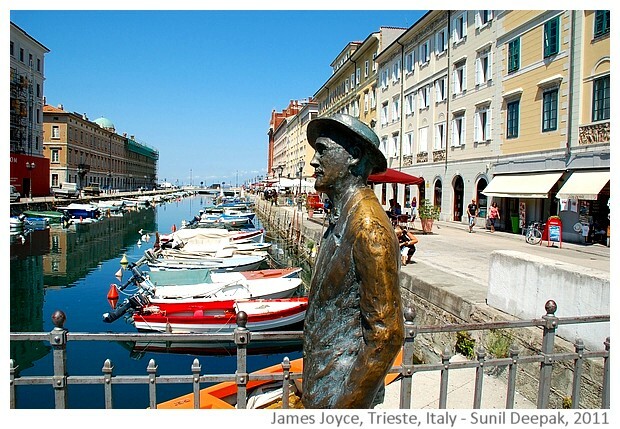 The last image of this photo-essay shows the statue of Irish writer James Joyce and is from the city of Trieste. Joyce is shown walking, crossing a bridge in the centre of the city. Joyce had lived in Trieste for many years. He is famous for his books like Ulysses and Finnegan's wake. I have loved putting together this photo-essay, even though identifying the pictures for this post took me hours of going through my vast picture archives. It was frustrating that from many countries, I could not find any image related to a book or a writer or a journalist. For example, I could not find any such image from my image archives of UK or Switzerland. No country of Africa is represented in this photo-essay for the same reason. Many countries do not put statues of writers in prominent public spaces, probably because often writers speak against their governments! Also because compared to national leaders, military persons and freedom fighters, for many countries writers and artists are not considered important enough to be remembered through art and sculpture. Finding images of art related to women writers is even more difficult - for this essay I could find only two of them. I hope that you will enjoy going through these images and perhaps share with me your experiences of finding the statues of your favourite authors during your travels! I would love to hear about any art works related to writers and/or their books, especially from countries not represented in this post. have you noticed the difference between our sculptures and their western counterparts ? we sculpt to get the job done, so ours are static, mostly with fix expressions .... while theirs are moving, in motion, contemplative, writing , with material strewn and scattered here and there... like apart of their life- as it ought to be. Hope we also love our writers better some day ..